We are a book family. I am a huge reader. No matter how busy and tired I am you will find me reading before I go to bed each night. I instilled that into my children of course. We have lots and lots of kid’s books and I continue to pick them up all the time. Little Green Books have become so of our fav. They are cute and colorful and most importantly eco-friendly! I was impressed when I first heard about Little Green Books ~ a new eco-friendly series from Simon & Schuster Children’s Publishing Division. Each book in this series will be devoted to educating children about the benefits of being green. 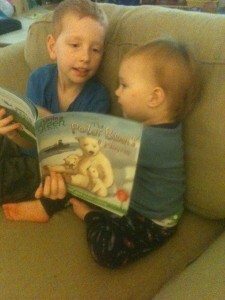 The book O’Bear is reading to P’Diddy above is The Polar Bears’ Home a story about global warming. It is printed on 100% post-consumer waste recycled paper with soy-ink. We love polar bears at our house and this is the cutest story about a little girl who is worried about the baby bears who got separated from their mother because the earth is getting warmer earlier each year and how it is affecting their life cycle. The next book we read is What Do You See? Why is this book so great? Besides the reason that the entire book is composed of 100% recycled materials, it is a lift-the-flap! Each new page has an endangered species hidden and we must guess what animal it is through the cute rhyme ~ “my pointed horn is hard to miss…and makes it hard for me to kiss!” ~ a rhino! A new family favorite is I Can Save the Ocean! Little Green Monster usually makes a mess at the beach, but soon learns why that is bad. 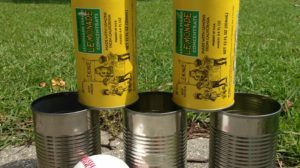 He changes his ways by recycling, reusing, and other clever ways to keep the ocean clean! We love our new Little Green Books and think it’s a fabulous way to start our little ones out young in learning how to take care of our planet! You can find Little Green Books on Amazon. I received these books for review. Links may be affiliate. All opinions are my own. We're a big reading household, too. And nothing warms my heart faster than seeing the kids reading together. I actually have a post coming up in the next couple weeks with a photo of them reading together. The photo with your boys was wonderful. Definitely love reading over here!! :) SOOO cute that they are reading together - what a great head start you have given your kids! !